Biography of Florentine Early Renaissance Painter. of 15th century Renaissance art. One of the least-known Old Masters and founders of the Early Renaissance in Italy, Domenico Veneziano worked in Perugia, Tuscany and Florence. Almost nothing is recorded of his early life: even Giorgio Vasari, the great historian and biographer of the Italian Renaissance, is reduced to making colourful but spurious assertions about Veneziano's life - recounting not only the false story of Domenico being murdered by Andrea del Castagno (Andrea predeceased Domenico! ), but also credits him with bringing oil painting to Tuscany. This, too, is incorrect, although it appears to be true that Domenico did introduce a new interest in colour and texture (colorito), to Florentine early Renaissance painting in which drawing and design (disegno) reigned supreme. His renowned masterpiece painted for the Church of Santa Lucia dei Magnoli in Florence, is The Saint Lucy Altarpiece (c.1445-7), whose central panel, Virgin and Child with Four Saints is in the Uffizi Gallery. One of the greatest Renaissance paintings of the quattrocento, its pearly colour and airy spaciousnesss was later reflected in the works of his principal assistant Piero della Francesca (1415-92), such as The Flagellation of Christ (1450-60, Galleria Nazionale delle Marche, Urbino). Born Domenico di Bartolomeo da Venezia, almost certainly in Venice, the details of how he learned to paint remain obscure. There is some suggestion that he trained under Gentile da Fabriano (1370-1427) in Florence, or even under Pisanello (1395-1455) in Rome, but the most likely explanation is that he trained first in Venice where he would have absorbed the International Gothic style. If so, it is probable that he also saw paintings by North European artists, such as Robert Campin (c.1378-1444), Jan van Eyck (1390-1441), and Roger Van der Weyden (1400-1464). Based on his use of linear perspective and the sculptural modelling of his figures, as revealed in the few paintings attributed to him, another important early influence on him was the short-lived genius Masaccio. Domenico is first documented in Perugia, in 1438, working for the Baglioni family. However, by 1439, having successfully petitioned Piero de' Medici of the Florentine Medici Family (1416-69) for commissions, he had settled in Florence. It was here - assisted by Piero della Francesca and Bicci di Lorenzo (1373-1452) - that he worked on his first documented project, a series of fresco paintings illustrating scenes from the life of the Virgin (1439-45) at the Church of S. Egidio, inside the Hospital of Santa Maria Nuova. However, in 1445, for some unknown reason, after painting the Meeting at the Golden Gate and the Birth of the Virgin, Domenico suddenly stopped working, leaving the fresco cycle to be continued by Andrea del Castagno during the period (1451-1453), and completed ultimately by Alesso Baldovinetti, in 1461. Sadly, the entire mural painting was lost during the 18th century. It was also during his early years in Florence - possibly during the period 1440 and 1441 - that he produced his excellent Adoration of the Magi (c.1433, Gemaldegalerie, SMPK, Berlin), almost certainly for the Medici palace in the city. Domenico painted his next documented work between the years 1445 and 1447. It was an altarpiece for the Church of Santa Lucia dei Magnoli, usually referred to as the Magnoli, or St Lucy, altarpiece. 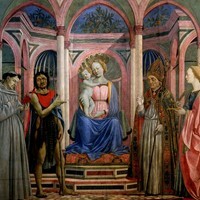 Regarded as one of the outstanding religious paintings produced in Florence during the mid-15th century - an achievement which places Domenico in a similar class to the great Tommaso Masaccio (1401-1428) - its main tempera panel, consisting of the Virgin and Child with Four Saints is in the Uffizi, Florence, while five other panel paintings from the predella are divided between the Fitzwilliam Museum, Cambridge; the National Gallery of Art, Washington DC; and Gemaldegalerie, SMPK, Berlin. According to Vasari, no sooner had Domenico finished the Magnoli Altarpiece in 1447 that he travelled to the Marches, accompanied by Piero della Francesca, to paint the ceiling of the Church of S. Maria in Loreto. Unfortunately, the project was never finished due to an outbreak of plague, and those frescoes that were finished were later destroyed. Domenico's last known work - a fresco mural painting of Saints John the Baptist and Francis - was painted for the Cavalcanti Chapel, in the church of Santa Croce. In 1566, during renovations organized by Vasari, the fresco was removed from the wall and lost. In 1454, upon completion of the pictures in Santa Croce, Domenico was summoned to Perugia, along with contemporaries Fra Angelico (c.1400-55) and Fra Filippo Lippi (c.1406-69), to give his opinion on frescoes painted in the Chapel of the Priors in the town hall, by Benedetto Bonfigli (fl.1445-96). He performed a similar task in 1457 in respect of the Trinity Altarpiece (1457, now in the National Gallery, London) for the church of Santa Trinita in Pistoia by Filippo Lippi and Francesco Pesellino (1422-57). No further works or activities involving him are known. He died in Florence in May 1461. Although initially inspired by the methods of spatial and figural representation pioneered by early Renaissance artists such as Masaccio, Paolo Uccello and Andrea del Castagno, his main area of interest was the expressive value of colour. This led to his outstanding ability in the reproduction of atmospheric light, and he created glowing, delicate gradations of colour by increasing the amount of (linseed) carrier oil used. His most famous student was Piero della Francesca, while he also inspired the Mantua-based painter Andrea Mantegna (1431-1506). Paintings by Domenico Veneziano appear in several of the best art museums in Europe and America.  For more biographical details about famous Italian Renaissance painters, see: Homepage.